Yahoo has a story about Drew Gintis, a high school wrestler who started taking Oxycodone as a senior. His doctor prescribed it to him after a shoulder injury that ended his wrestling career. At 21, he died from a fentanyl overdose. That these two things are related is all but a foregone conclusion. In 2015, the same year Gintis died, 52,000 Americans died of an overdose. In two-thirds of those cases, the drugs were opioids. The connection between high school athletics and prescriptions to potential gateway drugs like Oxycodone or Ocycontin is understudied but increasingly well-established. 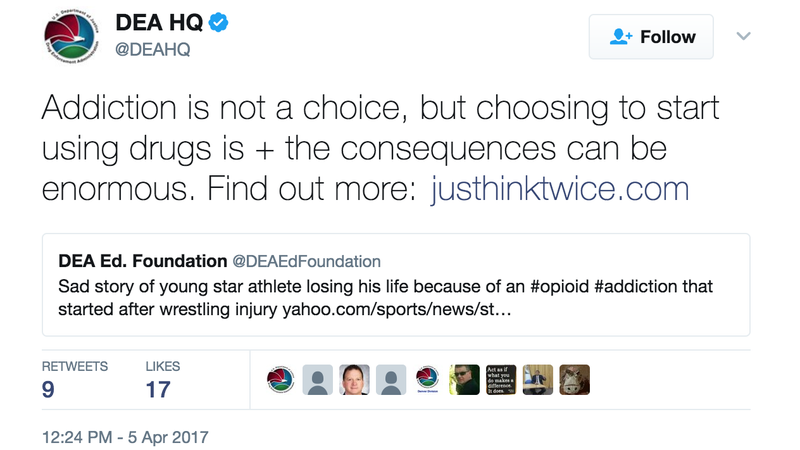 The DEA is quote-tweeting its own affiliate account—one that pays lip service to drug prevention and does mention the wrestling injury—to unsuccessfully (their typo’d link leads to an unsecure site) promote their website about scary scary drugs. It’s just a tweet, but it manages to be insensitive and ignorant at the same time. Blaming Gintis’s death on a one-time decision to take up drugs ignores the greater context of his tragedy, and oversimplifies a growing epidemic in ways that only make it harder to properly understand and deal with it.